Poster Caption: Copies of the Philadelphia printing of the Declaration of Independence (July 4, 1776) were sent to the thirteen colonies and then reprinted locally to spread the news to outlying areas. 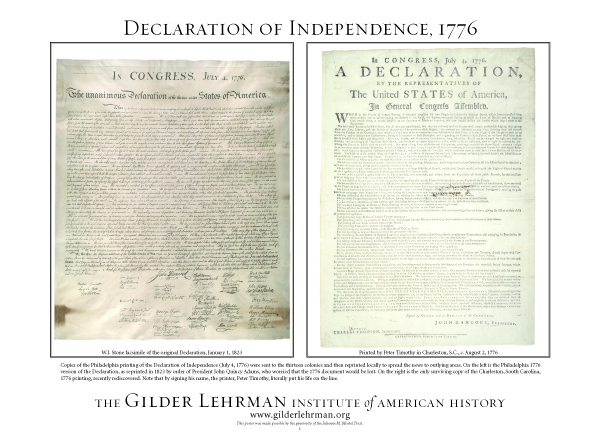 On the left is the Philadelphia 1776 version of the Declaration, as reprinted in 1823 by order of President John Quincy Adams, who worried that the 1776 document would be lost. On the right is the only surviving copy of the Charleston, South Carolina 1776 printing, recently rediscovered. Note that by signing his name, the printer, Peter Timothy, literally put his life on the line. These posters are 22" x 30", full color, and printed on a semi-gloss white stock. Each one features a caption that places the image in historical context.